Destoning and pureeing stone fruits and berries into juice or puree. 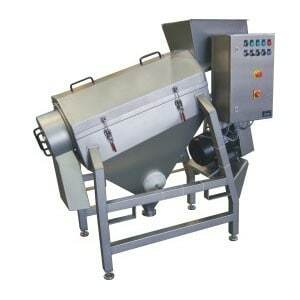 The destoning machine can process all stone fruits and berries. It has the capacity for up to 5000lb of fruit per hour. Like apples, the bin tipper lifts the cherries and drops them into a water bath before heading up the elevator. They are directed down a chute and into the top of the destoner. Then, it separates the flesh of the fruit from the pit, resulting in a puree. The mash is pumped into IBC’s and the puree is treated with enzymes to extract juice. Puree is processed immediately for smoothies or left in IBCs for fermenters. The fruits need to be soft for the best result and higher yield. Stone fruits like cherries and peaches need to be processed soon after picking and before rot or mold sets in. It is a dance with time to process the fruit when it is soft and sweet. We recommend booking your time-slot early to avoid possible spoilage.